As tens of thousands of politicians, diplomats, NGO-workers and journalists descend on Doha for the two-week feeding frenzy known as the UN’s annual climate-change summit, the latest report from the UN Environment Programme (UNEP) shows that matters climatic are going from bad to worse. Greenhouse-gas emissions are now about 50 gigatonnes of carbon equivalent (GtCO2e). That is 20% higher than they were in 2000 and, worryingly, 11% higher than where emissions need to be in 2020 in order to ensure global temperatures do not rise by more than 2 degrees Celsius (see light red range in chart). If emissions go on rising at their current rate, they will reach 58 GtCO2e in 2020, 14 GtCO2e more than they need to be then (current policy). In theory, this would not matter too much if greenhouse gases were cut more dramatically later (though costs would be higher). The trouble is that countries are not promising to make big enough cuts. UNEP has looked at the emission-reducing impact of the various promises countries have made since the Copenhagen climate-change conference in 2009. If countries implement their least ambitious pledges and allow lots of loopholes and lenient rules, this will make no real difference: emissions would be only 1 GtCO2e less than business as usual (case A). 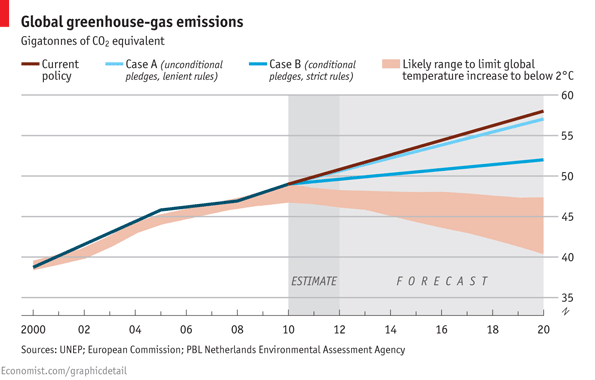 Even the implementation of the most ambitious pledges, subject to strict rules, would take countries less than half way to where they need to be to keep global temperatures from rising more than 2 degrees (case B). And emissions would still be rising in 2020.